As budgets tighten, throughputs increase, and downstream protocols become more exacting, serious efforts are being made to make the most of nucleic acid sample preparation. Whether it’s different devices to gather clinical or potential bioterror samples, innovative methods to enrich and purify samples, better ways to mash them up, or efficient ways to move them about, researchers at Knowledge Foundation’s “Sample Prep” meeting, held recently in San Diego, had much to talk about. A lot has been made lately of next- (second) generation sequencing, characterized as being faster, cheaper, and more massively parallel than Sanger sequencing. Yet next-gen sequencing generally suffers from relatively short DNA read lengths. FLIR Systems is gearing up for next-next (third) generation sequencing. Many of these newer sequencers will require DNA inputs that are in the tens, if not hundreds, of kilobases in length, said senior laboratory scientist Milena Iacobelli Martinez. Working under a grant from the Defense Threat Reduction Agency (DTRA) to develop technology for detecting biothreats, FLIR has created an automated sample-preparation device that isolates 20–50 kb DNA. The prototype uses a single disposable cartridge to input up to 1 mL samples, and it lyses spores, vegetative cells, and viruses by a combination of chemical and mechanical means. It’s “really a compromise” between using enough strength to break open the spores and yet not overshear the DNA, she pointed out. SCODA—which stands for synchronous coefficient of drag alteration—takes advantage of the fact that nucleic acids undergo a dramatic, nonlinear, physical change under an electric field. “This distinguishes them physically from other molecules: proteins, humic acid in soil, polysaccharides—whatever you might have that could be inhibitors of downstream analysis,” said Andre Marziali, Boreal Genomics’ president and CSO. Instead of relying on the more traditional solid-phase extraction—binding to a surface, washing, and eluting—SCODA “is taking DNA in a gel and focusing it to a spot at the center.” Meanwhile inhibitors, even those with similar chemical properties, either pass out of the gel or don’t enter it at all. Among other opportunities, Dr. Marziali is looking toward medical diagnostics. 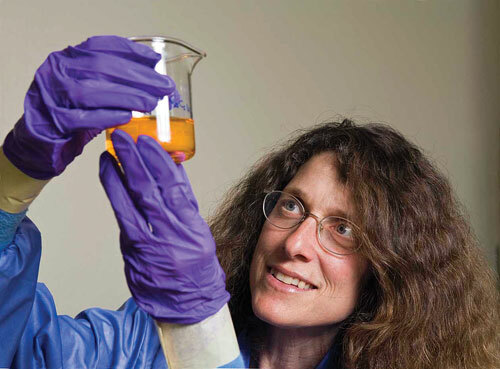 A pathogen may be present in a few copies per milliliter of a clinical blood sample containing 100 µg of human DNA in the background, and “we believe that we can enrich for the pathogen DNA, leaving the human DNA behind,” Dr. Marziali said. Similarly, disease markers can be enriched in cancer patients’ blood, as can fetal DNA taken from a maternal sample—situations “where ultimately the inhibitors are not now blood components, they’re really human DNA. Research into de novo pathogen detection at the Sandia National Laboratory utilizes more conventional molecular biological principles, but a less-than-conventional platform, to enrich nucleic acids. Unlike PCR- and other probe-based technologies, next-gen (and next-next-gen) sequencing doesn’t require advanced knowledge of the target sequence. You read the entire genetic code and then use phylogenetics and the like to categorize and classify. Yet with human DNA and background flora and fauna DNA in the mix, finding pathogen DNA in matrices such as nasopharyngeal swabs is like looking for “a needle in a haystack,” said senior scientist Kamlesh (Ken) Patel. They also use a normalization process to get rid of high-abundance DNA: DNA is denatured and allowed to re-anneal for a set time. Higher abundance sequences will find their complement faster than the rare fractions—similar to a C0t analysis. The double-stranded DNA is then either digested or separated out from the remaining single strands (among which the rare pathogen DNA would lie) using hydroxyapatite. All this is done on an automated miniaturized platform. Digital microfluidics manipulate single-digit microliter volume droplets by altering the voltage at each square of the platform, allowing reagents to be brought to the sample, and the sample itself to move to different squares. The device is connected with various lab-on-a-chip modules, such as a capillary tube-based heated microreactor, by means of a syringe pump. The platform manages reactions at a scale and concentration that can directly interface with an Illumina flow cell. “We’re technically sequencer-agnostic,” Patel said. The firm has focused on Illumina first, he explained, because of its familiarity and also its collaborators. In order to eliminate much of the background DNA that interferes with its de novo pathogen detection work, Sandia National Laboratory researchers use a two-pronged approach that includes exome capture beads and a normalization process to get rid of high-abundance DNA. Sometimes gathering nucleic acids for identification of pathogens is done in more mundane ways. Current practice for tuberculosis and other lung ailment diagnostics requires sputum, which is difficult to collect and often contaminated by saliva. A nebulizer may be needed to aid patients unable to produce sputum normally, while in some cases a bronchoalveolar lavage is required. Deton engineered a small device to collect intact bacterial aerosols that are coming out of a cough. “The sample can be extracted from the device and sent to the lab, just the way it’s being sent right now,” said principal Patrick Sislian. “But instead of sputum it would be in a buffered solution: more concentrated than sputum, and without having those negatives that the sputum samples would.” The instrument looks similar to CPAP masks used for sleep apnea, connected to a palm-sized box with a liquid-filled chamber where the samples are collected. It is designed to be extremely simple to use, completely disposable, and powered by a lab vacuum. With a projected price point of about $250—less than that of a nebulizer treatment—Sislian thinks the Deton device “would have the economic and the practical advantage” over current practice. He expects the prototype to undergo testing on a few patients within several months, with a larger patient study further down the road. As part of his chemical engineering doctoral training at UCLA, Sislian studied the use of aerodynamic shock to lyse both bacterial spores and vegetative cells, and created a prototype device that he ultimately hopes to integrate into the cough analyzer. “We’re also looking for people to partner with on the biosensor side,” to integrate nucleic-acid testing into the device as well. What’s different about Bertin’s Precellys line of biological sample grinders, she said, is the specific movement of the tubes. In addition to moving up and down they also move on the lateral aspect, making the beads form a figure 8 inside the tube, which allows for more efficient grinding. To homogenize tissue, spores, noncultivatable microorganisms, and even viruses, samples are placed in a tube with buffer and beads. Different samples demand different sizes and different material beads—glass, ceramic, or metallic. The 2,000 or so protocols on the Bertin website will also indicate the optimal speed and duration. “If you go too strong or too long, your sample will be damaged and your results will be bad,” Brossard-Desjonqueres noted. Earlier this year Bertin launched Minilys, a smaller bead beater-homogenizer, based on the same technology. Minilys can accommodate either three small (0.5 or 2 mL) tubes, or a single 7 mL tube. Other models, designed for higher throughput, can handle up to 24 tubes simultaneously. These are available as stand-alone units—which give R&D-type labs flexibility in terms of sample type and size—or integrated into a global solution. 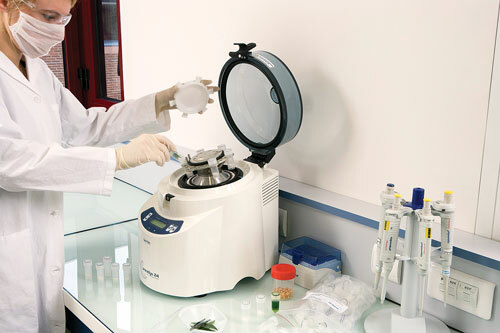 According to Bertin Technologies, Precellys 24 combines speed and efficiency to grind, homogenize, and lyse a range of sample types.